Celebrate Crafts: I won a Liebster award! 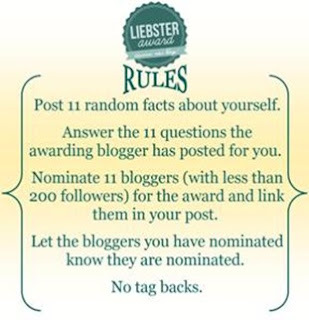 Imagine my surprise while reading the comments from yesterday's blog hop post for the March SOTM blog hop, I received a comment from CHill (click on her name to visit her blog), nominating me for a Liebster award! Now, I was not sure what a Liebster award was, so I had to look it up. The award is given to bloggers by other bloggers that have less than 200 followers. There is no real "Award" , but the award can be the recognition itself. Thank you CHill for the award! There are a couple of rules for the award. 1. When I am working on my crafting I like to listen to 80's hair bands. 2. My 1st car was a Chevrolet sprint. I did not purchase this car, a family friend did for me. I ended up having to sell it after it left me stranded in the middle of a busy intersection. 3. I LOVE Postit notes. 4. Growing up we had cats for pets. When my hubby and I bought our house, he wanted to get a dog. I was not too sure about this, but we got one and I don't know what I would do without her. Even though she gets into the trash. ALOT. 6. I have only been crafting on a regular basis for about 5 years. 7. I have never been to either Disneyland or Disneyworld. 9. I wish I was more organized than I really am. 10. I don't know how to swim. 11. I like to watch sports. If you had to name a defining moment in your life, what would it be? When I had my children. If you could choose a super-hero power, what would you pick? Why? To fly. I think it would be cool to be able to go where ever you wanted. What is your favorite book? I don't really have a favorite. I love to read. Do you have a hobby/hobbies? What is it? I am a scrapbooker. What’s the farthest from home you’ve ever travelled? The farthest I have travelled is to Washington D.C.
What’s the most important thing to you on your bucket list? To visit my family in Greece. Could you live as a vegetarian? Vegetarians and vegans: Would you ever choose to eat meat? Why? I could live as a vegetarian. I would need to re learn how to cook though! Are you right or left handed? If you could change, would you? I am left handed when I write, right handed for everything else. If you could pick your own name, what would it be? OR, what is your nickname? My friends call me Theo.